In World of Warcraft Patch 6.2, we introduced a new series of seven different weekend Bonus Events, two of which feature Timewalking Dungeons—one in Outland dungeons for characters level 71 and higher, and another in Northrend dungeons for level 81 and higher. When you Timewalk these dungeons, your character’s power and gear will be scaled down to a fraction of what they normally are, and as you may have never ventured into some (or any) of these dangerous places, it might be a good idea to prepare yourself now. Desperate to save their kingdom from collapse, the trolls of Zul'Drak have turned on their ancient gods. The wild deities are now considered a source of untapped power, their potent blood providing the means to repel the Lich King's minions, who have overtaken parts of the troll nation. Heroes have recently journeyed to the beleaguered region to strike at the savage Drakkari and their maddened prophets. Even so, the greatest threat to the region is rumored to lie undisturbed within the capital of the ice trolls' empire, Gundrak. In the depths of the city, the most sacred shrines are said to be steeped in the mojo of slain gods. Surrounded by this dark energy, twisted Drakkari high prophets grow in power, infusing their followers with incredible strength. If left undisturbed, the trolls of Gundrak may soon unleash their burgeoning might, plunging the entire region into chaos. Slad'ran took no pleasure in sacrificing the loa he had served all his life. As the powers of his god surged into him, the high prophet swore that the Scourge would suffer for the atrocities the Drakkari trolls were forced to commit. The Drakkari sealed their failed gorloc experiments away after numerous attempts to weaponize them. As the frost trolls battled the Scourge invading their beloved homeland, Eck and his minions awaited the moment their freedom was at hand. The Drakkari sought to sacrifice Mam'toth for his powers, but instead the loa destroyed himself. Despite this act, Moorabi would not be denied his god-like powers. The high prophet drank of the loa's blood and will now stop at nothing to keep Zul'Drak firmly in troll hands. The Drakkari turned to their loa as the Scourge invaded the nation of Zul'Drak. The frost trolls did not come to the loa with implorations; they came with blades. As blood flowed from their murdered god, Akali, the high prophet Gal'darah and his betrayers claimed the loa's strength as their own. Slad'ran summons snakes. Keep them off your healer. Stay out of the poison pools created by the Elemental form of Drakkari Colossus'. Move! Definitely talk to your group about the Less-rabi achievement well in advance of pulling Moorabi. Eck can spring toward anyone in your party. Tanks should prepare to regain aggro. Gal'darah can be a complicated fight. In one phase, you want to stand back, but in the other, you should be very close to him! If you haven’t earned these achievements already, completing this dungeon will award Gundrak and Heroic: Gundrak . Get in there and Fight! 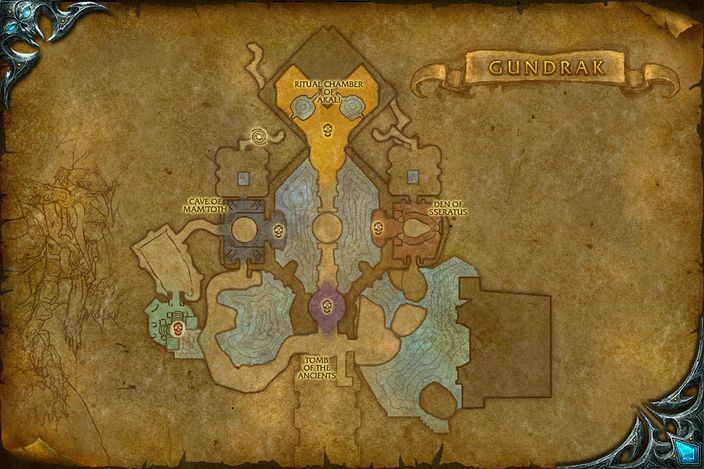 Timewalking dungeons have come to WoW! During the Wrath of the Lich King Timewalking weekend, keep an eye out for the weekend-only quest "A Frozen Path Through Time", which rewards a Seal of Inevitable Fate when you complete five Wrath of the Lich King Timewalking dungeons. What's your main goal in Northrend Timewalking dungeons? Transmog? Achievements? Will it be your first time in Gundrak? Let us know in the comments below.